So... How many applications are in one tube? How many applications are in one tube of mascara? She didn't stop there, though! Thanks to her commitment, we can now calculate the number of applications in multiple beauty products, including liquid lipstick, eyeliner, or foundation. If, until today, you firmly believed that it's impossible to finish a nail polish bottle, or if your mascara tube always ends when you least expect it, you should give this beauty products calculator a try! This handy tool uses information about your beauty product (such as mascara) to find out how many times you will be able to use it. Unlike the predictions given by makeup manufacturers or influencers, this calculator takes into account your makeup habits, too, providing you with a much more accurate estimation. Product type. Choose one from the list - it can be mascara or liquid eyeliner, but also foundation, liquid lipstick, or even nail polish. Efficiency. It is the number of applications per one milliliter of the product. Don't worry; you don't have to know this number - our calculator will fill out this field automatically! Product volume. You can find the volume, either in milliliters or fluid ounces, on the product packaging. If you already discarded the packaging, you can also check the volume on the manufacturer's website. Product price. How much did you pay for the product? Number of layers per application. For example, you will usually use only one layer of foundation, but at least two coats of mascara or nail polish. Applications per day. How often do you retouch your makeup? Some women can put on their foundation in the morning and don't need to touch it up during the day. Lipstick, on the other hand, requires multiple applications per day. In the case of nail polish, you will probably only need 1-2 applications per week. Naturally, this result is just an estimation - the actual lifetime of your product will depend on its consistency and thickness of the layer you apply, too. Nevertheless, the prediction will surely give you an idea of how many applications of a product you're actually buying. To give you a quick overview of what our calculator can do, we created a step-by-step example for a tube of mascara. In the first step, we chose the mascara we wanted to analyze. We settled for a tube of 0.34 fl oz volume that costs $4.49. Then, we decided that we'll apply two coats of mascara once a day. 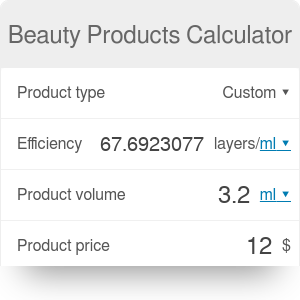 Beauty Products Calculator can be embedded on your website to enrich the content you wrote and make it easier for your visitors to understand your message.